KIEV, Ukraine -- A European Union envoy, on a mission to Ukraine to save a December 19 summit from failure, said on Tuesday he had voiced serious concern again to Ukrainian President Viktor Yanukovich over the jailing of opposition leader Yulia Tymoshenko. 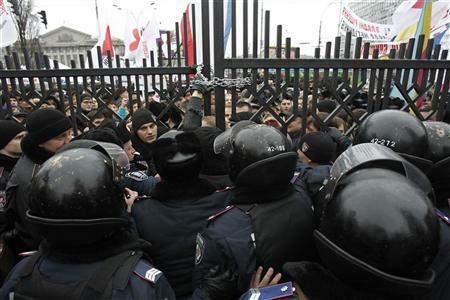 Riot police block the gate during a rally held by supporters of former Ukraine's Prime Minister Yulia Tymoshenko before the hearings on Tymoshenko's appeal against her jail sentence outside a court building in Kiev December 13, 2011. Tymoshenko, a former prime minister, was jailed for seven years in October on charges of abuse of office after a trial the EU says was politically motivated. She says it is a "lynching" by Yanukovich, an old political foe who only narrowly beat her in a run-off for the presidency in February 2010 after a bitter contest. The Tymoshenko affair has thrown into jeopardy next week's summit in Kiev, which was meant to lay the ground for a new strategic relationship between the ex-Soviet republic and the 27-member body. In Brussels, Ukraine's envoy to the EU said he did not now expect the bloc to initial key agreements at next week's summit, as had been originally envisaged. EU commissioner Stefan Fuele, the bloc's point man on Ukraine, held more than three hours of talks with Yanukovich in Kiev on Monday night and then visited Tymoshenko for a half-hour at the Kiev prison where she is being held. "I underlined that the EU is concerned about lack of progress on a number of critical reforms in Ukraine, including those in the constitutional and judicial spheres and we have had substantial discussions on these," Fuele said of his talks with Yanukovich and others. "I also reiterated our serious concern over recent cases of selective justice in Ukraine, including the cases of Yulia Tymoshenko and others," Fuele said in a statement. With Tymoshenko, he had discussed her health and developments in her case. "I informed her about the EUs concerns regarding this process and assured her that we would continue to follow closely her appeal and would insist upon the need for her to benefit from of all her rights to defend herself in a fair process," Fuele said. The envoy gave no indication that there had been any change of heart by Yanukovich or any sign he would intervene to bring about Tymoshenko's release -- indeed the authorities have been piling up charges against her rather than the reverse. Last Friday, authorities convened a special court in her prison cell and formally "re-arrested" her on a new criminal charge of tax evasion, prompting her lawyer to say that the authorities clearly intended to keep her locked up indefinitely. The abuse of office charge, for which she was sentenced in October, relates to brokering a gas deal with Russia in 2009 when she was prime minister. Political insiders in Kiev say the prosecution of Tymoshenko, a charismatic populist whose fiery rhetoric brought tens of thousands out on to the streets in the 2004 "Orange Revolution" protests, is personally driven by Yanukovich. Yanukovich was ultimately denied the presidency by the Orange Revolution and insiders say he has never forgiven Tymoshenko for that or for her biting personal attacks during the 2010 presidential campaign. About 1,000 of her supporters, chanting "Yulia Freedom! Yanukovich to prison!," gathered outside Ukraine's Appeals Court on Tuesday when her appeal against October's verdict opened. Tymoshenko's defence lawyer Serhiy Vlasenko told the court that her health prevented her being present at the hearing. Her family say the 51-year-old is suffering from back trouble. Vlasenko told journalists outside the court: "All Yanukovich has to do is give the order to change the court's decision and it will be done. The decision (to release her) does not lie with the Appeals Court and you know this." The EU and Yanukovich's government had been expected to set course on a new strategic relationship at next week's summit, which involves agreements on political association and creation of a free trade zone. But Ukraine's ambassador to the EU, Kostiantyn Yelisieiev, said it appeared unlikely these documents would now be initialled. "For our side there is full fledged political will to initial at the summit," Yelisieiev told reporters in Brussels. "Unfortunately, you need two to tango and as I understand, there is no political will on the EU side to initial at the summit because of the position of some member states." EU diplomats have said that a joint statement simply acknowledging that talks have been formally concluded may be an alternative option -- but this would be tantamount to a diplomatic failure.